Many people don’t realize, there is plenty of fantastic hiking not too far from the concrete jungle also known as NYC. Ever since our hike in San Sebastian, I have been wanting to explore more hiking trails in my local area. However, getting to many of these spots requires a car (which I don’t have). 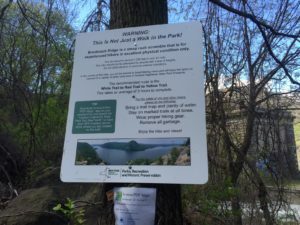 I had heard good things about the Breakneck Ridge trail and that Metro-North trains stop there on the weekend, so I thought we should give it a try. Let me tell you about our experience doing the hike and share some logistical details so you can do this challenging hike too. One of the many scenic views from Breakneck Ridge that make it worth all the effort. We planned to hike up the steepest trail – Breakneck Ridge (marked in white). Instead of going back down that way there was an option to make it a loop and go down an easier way. We would turn left on the red trail (Breakneck Bypass) which would dead end into the yellow trail (Wilkinson Memorial). Then, we would turn left on the yellow trail and that would take us right back to the train. Following these Breakneck Ridge directions, we would cover 3.7 miles and go up about 1,400 ft (most of that in the first mile). Anisa taking a well-deserved break! The name Breakneck Ridge is a little intimidating, and it does live up to its name. It is by far the most difficult hike I have ever done. 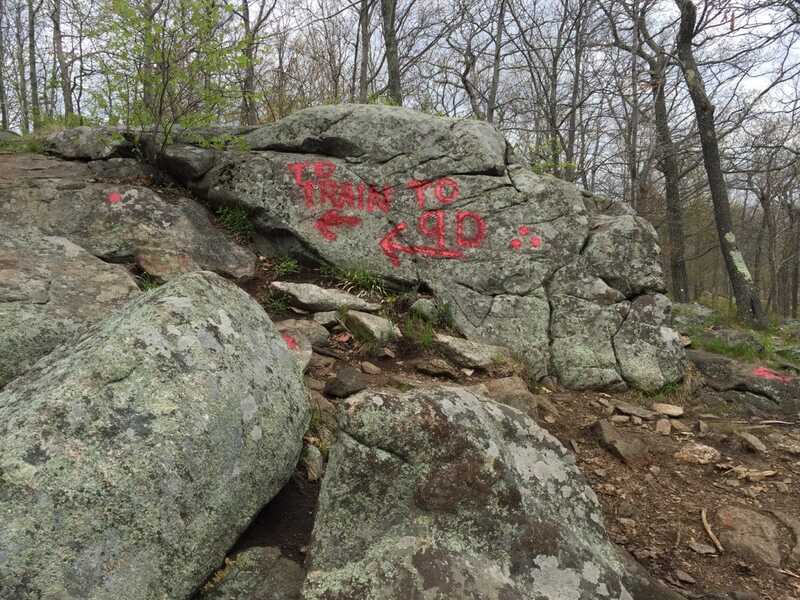 The sign at the Breakneck Ridge trailhead said, “This is not just a walk in the park.” It is a steep rock scramble and you should be in excellent physical condition and an experienced hiker. Well, we have both done some hiking – so that makes us experienced right? As for the excellent physical condition, well we are working on it. I have had some knee issues in the past and Russell has back pain. In all seriousness though, you should not underestimate the Breakneck Ridge hike difficulty. The warning sign at the Breakneck Ridge Trail head. From the sign, we also learned about a helpful app, Avenza PDF Maps. It has trail maps and uses GPS to show you where you are when you are hiking. It is free to download but you may have to buy some of the maps. The map to use for the Breakneck Ridge trail is Hudson Highlands State Park Trail Map North which is one of the free ones. We used it during our hike. If prefer not to use the app, a GPS watch may be helpful. He was right! There were a lot of very steep steps that you would need to grab onto the rock above and pull yourself up. It didn’t help that I am short! I think the Breakneck Ridge trail sometimes crossed the line between rock climbing and hiking. There were a couple of points with huge steps where I couldn’t find a place to get a grip to pull myself up. I wasn’t sure what to do, I couldn’t turn around because I wasn’t sure how I would be able to go down the trail and I wanted to do this hike. Eventually, I was always able to figure out a way to get up. I may have not always been graceful climbing Breakneck Ridge, but I didn’t have any other options. Russell with the go pro and you can see the line of people behind him. The Breakneck hike was well marked but there were many options on which route to take. For example, the right side of the tree might have steeper steps so we would go to the left side. At one point, there was a sign that said “easier ascent,” but in many cases, you wouldn’t know which way was harder until you got to a point that was tough. In addition to the difficulty of the hike, there are a few other points you should be aware of if you do decide to do this hike. When we went, there were lots of bugs, mostly flies. We didn’t get bitten but for most of the hike, bugs buzzed around my head. Also, we saw a snake. Well, we probably wouldn’t have seen it, if it weren’t for someone pointing it out to us. Luckily, it was sleeping in the brush off the trail, but you should be careful. Officially, there are four scenic lookouts on the Breakneck Hiking Trail, but I counted way more than that. Anytime I stopped for a break the view was amazing. The first official scenic view is at 686 feet where the flags are. We took some time to take pictures and enjoy the view of the Hudson River. Then we turned around and saw how much higher we had to go! We better keep moving. Occasionally, we would also look at the map on the app we had downloaded, and especially during the steep start, it was a little demotivating to see how far we had gone (or not gone). Obligatory selfie! We were so lucky to have perfect weather. The sky was so beautiful. We were so thankful to finally reach the summit. It hadn’t even been a mile and we still had a long way to go, but at least we knew it would get easier from here. After hiking a bit more, we saw the turnoff for the red trail. For the most part, this trail was a steep decline. It wasn’t steps though. Then we came to the yellow trail. This trail was pretty easy, which was so welcome after all we had done. It was a nice walk through the forest and we even saw a cute little waterfall. It took us a little more than five hours to complete the hike. Red writing on the rock to signal the turn to go back to the train station. 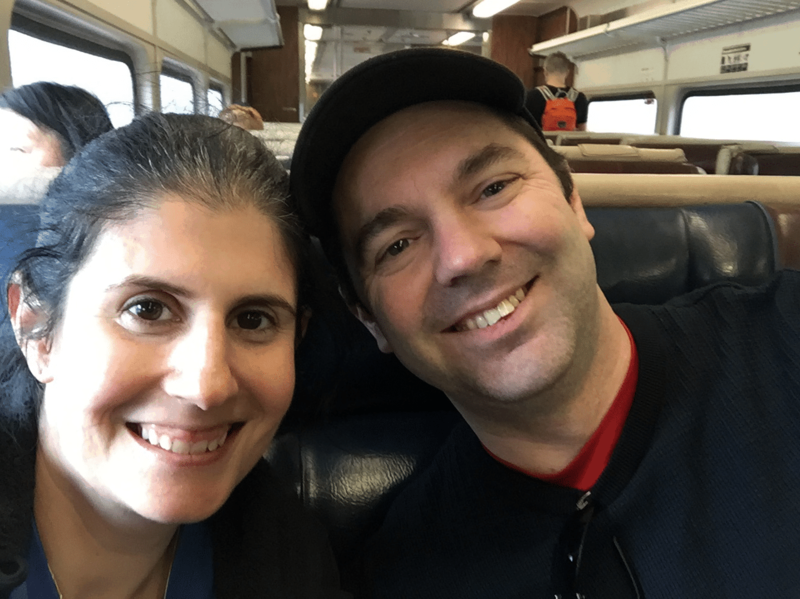 All smiles on the train ride home, but let me tell you, we were exhausted! Then we headed to the train. It is best to use the pedestrian walkway to get to the stop for the trains going back to New York City. We had a little time before our train so we reflected on our day. We both felt a great sense of accomplishment. Am I glad I did it? Definitely. Was it all worth it? Yes! Would I do it again? Maybe. I would make sure I was better prepared and I would probably tape up my knee too. The views were spectacular but the hike was difficult and scary at points. Russell created a short video which will help give you a feeling for what it was like. Two-mile hike – Start at the white (BR) trailhead, head north. Turn right on yellow (UC) trail. Turn right again on the red (BK) trail and finish on the road about 15 minutes walk from the Breakneck Ridge train stop. Five-mile hike – Start at the white (BR) trailhead, head north but continue straight beyond both yellow and red trails. Turn right at the blue (NT) trail to head South. At the fork, continue on the red (BK) trail then turn left on yellow (UC) trail. Turn right on white (WB) to end up on the road 15 minutes walk from the town of Cold Spring. Six-mile hike – Start at the white (BR) trailhead, head north but continue straight beyond both yellow and red trails. Keep going straight where the blue trail goes off to the right. Keep going until you can turn off onto the blue (NT) on the left. Take the blue. Soon after that, you will turn left to head south on the yellow (WM) trail. Continue all the way until the road close to the train stop. *** Note all mileage is approximate. Keep in mind there are steep sections so it will take longer than you expect to do the hike. Some miles may take more than an hour. Time will vary greatly depending on ability level. It’s better to have extra time than to be worried about it getting dark while you are still hiking. In all honesty, we should have been better prepared for the hike as it was much more challenging than I expected. I wore sneakers, but if I did it again I would wear hiking boots. As I mentioned, it would have been nice to have gloves to help with some of the climbing sections. Bug spray would have helped to keep the bugs away. Anytime you are spending time outdoors, you also need sunscreen. We did bring food and water with us which was good because we did not see anywhere to buy anything once we got off the train. Cold Spring is the closest town and it is two miles away. The Breakneck Ridge train runs about hourly on the weekends – check the schedule here. I would recommend that you get up early to catch the train since the hike is popular and can get crowded. It’s a scenic an hour and a half along the Hudson River from Grand Central to Breakneck Ridge. To get out at the Breakneck Ridge Train Station, you will need to move towards the back of the train. The only door that will open is the one at the front of the last car. The Breakneck Ridge train stop is very basic, there is just a tiny yellow wooden platform. Once you get off the train, walk towards the road. Turn right and walk along the busy road toward the trailhead for Breakneck Ridge, which starts right before the tunnel. Across the street from the train, we saw the trailhead for the Wilkinson Memorial Trail, where we ended our hike. 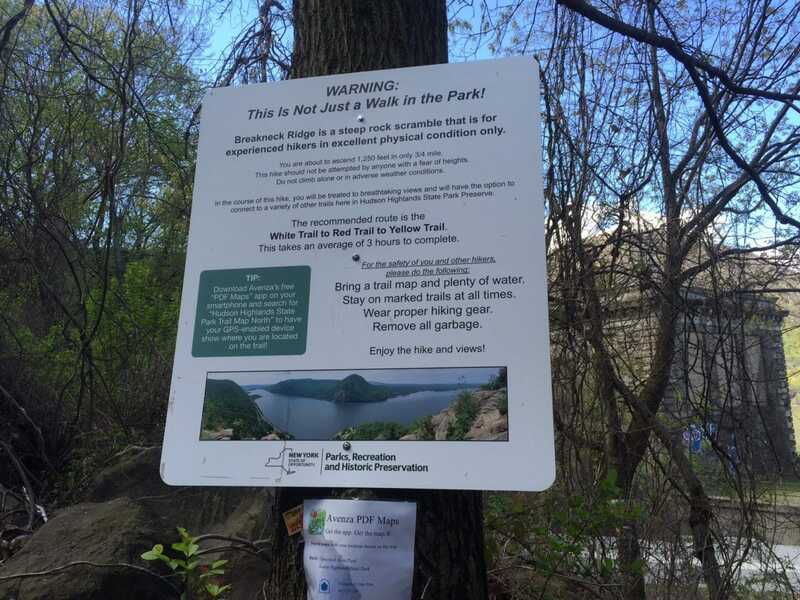 If you want to hike Breakneck Ridge during the week, the nearest train station will be Cold Spring, which is about 2 miles from the trailhead. You could also drive as there is a small parking area by the tunnel where the trail starts. If there aren’t any spots there, follow the road north and you will see a larger parking lot on the left. 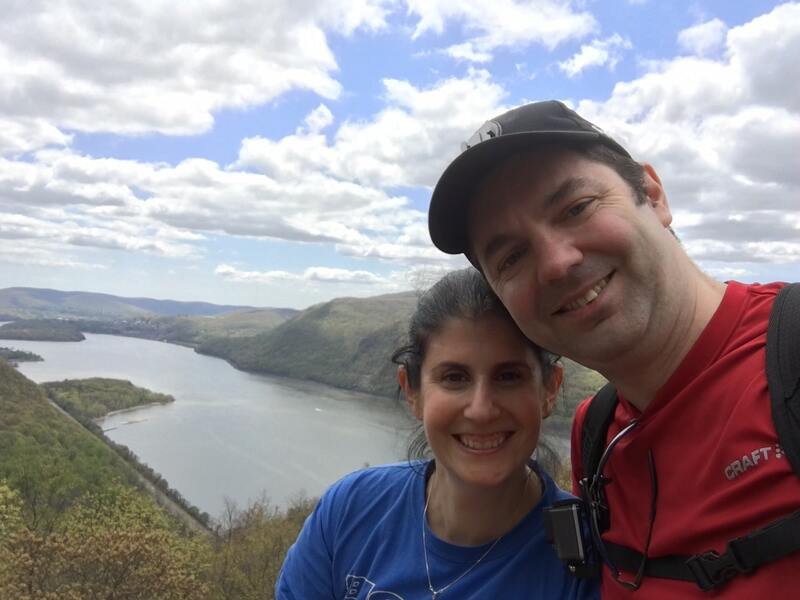 Have you hiked the Breakneck Ridge Trail? I would love to hear about your experience. On the weekend, there is a Breakneck Ridge stop on Hudson Line Metro-North trains. The Breakneck Ridge trail is a difficult hike, so you should be an experienced hiker and in decent shape. I would also not recommend it if you are afraid of heights. 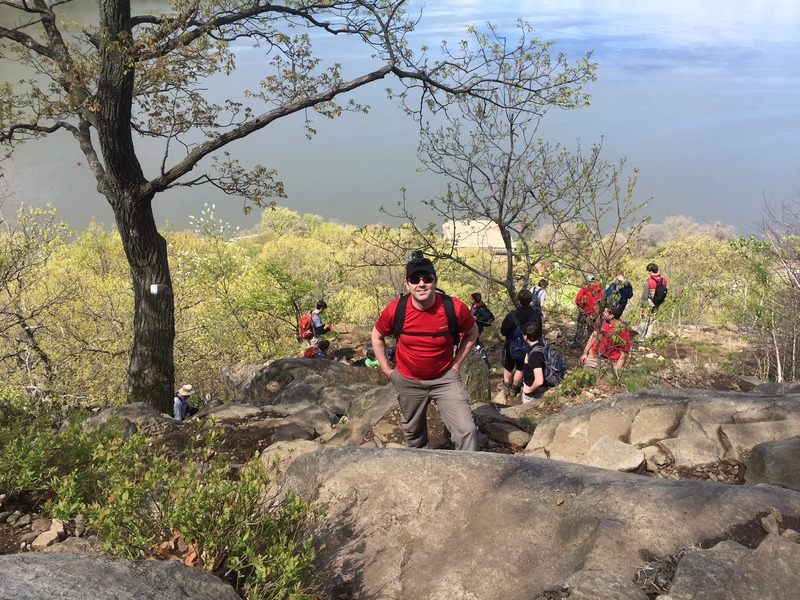 Preparation for hiking Breakneck Ridge is key – make sure you have water, food, gloves, sunscreen, and bug spray. Download the app so that you can have the Breakneck Ridge trail map on your phone. You can find it inside the Hudson Highlands State Park Trail Map North. You may also enjoy these other helpful apps for hiking. If you would like to do more hiking in the area, check out my list of the best hikes in the Hudson Valley. NextFun Times Biking in Central Park + A Discount Code! Those views!!! Sounds like hard work but well worth it. Yes you really earned the views. It was by far the hardest hike I’ve done. One of the most rewarding hikes I’ve ever done. Certainly the hardest, but it was definitely worth the effort. Thanks so much for doing it with me. I don’t think I would have been able to do it without you. I love this hike – its pretty difficult and great views! Agree! There were definitely times I was asking myself why I decided to do the hike and then turned and saw the views! The views look worth it! Yes! The views were amazing! The hike was a lot more difficult than we expected. Wow, this place looks awesome! I love NYC, and I had no idea this was so close and accessible by train. Yes it is really easy to get to and there are great views. It is a really challenging hike though. Incredible photos and great tips! I’d never think of bringing gloves for a hike. I’ve never heard of Breakneck Ridge although I’ve been to NYC a few times. It looks a world away from NYC! The hike does sound extremely challenging, but the good thing is that the more challenging it is, the greater the sense of accomplishment you get! Haha yes! Most hikes I go on I am able to manage without having to put my hands of the rocks to pull myself up, so yeah never needed gloves. The hike was a great little getaway and I did feel pretty proud of myself when I finished. Way to accomplish this! Pulling yourself up doesn’t sound easy! Great to find your blog via #TheWeeklyPostcard! Thanks so much for the encouraging words and for stopping by. I am pleasantly surprised by this place. Like you mentioned, not a lot of people know of great hiking spot close the NYC metro area. It is the same thing with Los Angeles. There is plenty of hiking not so far from the city. I am taking notes of this place to suggest it to my sister (lives in NYC). Yes, it was a great hike but very challenging. It is really nice to have escapes close to cities like this. Breakneck Ridge looks amazing, but I’m sure it was named like this for a reason. I’m not acquainted at all with the hikes in New York area, but we have plenty of beautiful hikes in Los Angeles too. I’m sure you felt quite rewarded for your efforts after reaching the top. Thanks Anda. Yes I love hiking so try to fit it in whenever I can. Breakneck Ridge was a very rewarding experience. The views are gorgeous. 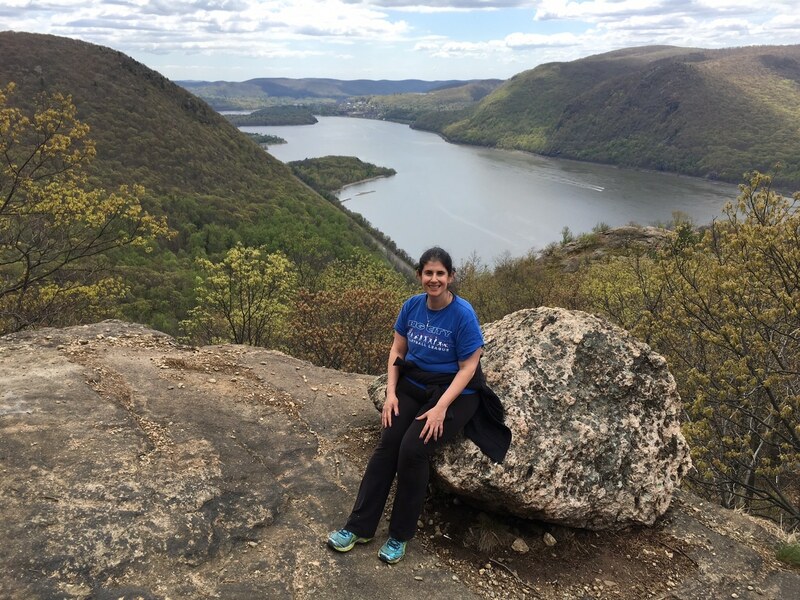 True, Breakneck Ridge – the name inspires fear for I am not a hiking kind of person but one who loves to be in nature’s lap. Bushra – Thank you! The hudson valley is a beautiful area. Even if you are not a hiker, it is worth a visit. Well, I would have gone out for the train ride and maybe a little bit of hiking, but it looks like it might have been more than i would want to do. Yes it was more than I wanted to do too, but once you are part way up the trail you really have no choice but to keep going. There are definitely other hikes in the area that are easier. These views look totally worth it! Very cool. Thanks Megan. It was tough but we really enjoyed it. We love soft adventure travel and any hike is awesome for us! We are going to save this so we can read more once we finally finish planning our US itinerary. This sure is on the list now! Cory – It really is a great hike and I love that you don’t need a car to get to it!